The Hacky Sack has been a very viable alternative to a soccer ball for generations. 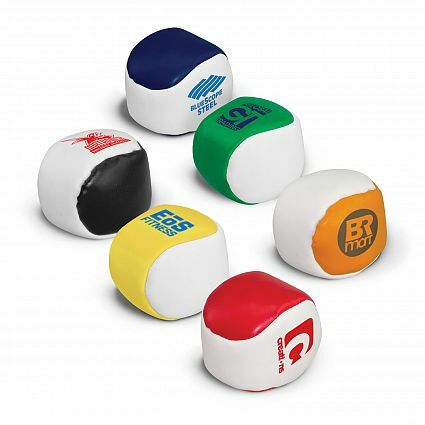 Our Ezypromos PVC hacky sack ensures no child remains bored or inactive. We at Ezypromos offer high quality material, durability, and longevity in our products and the Hacky Sack is no exception. It’s the ultimate in keepie-uppie and grand dexterity. A very fun and high-energy ball which is filled with dry grain. The origins of the name comes from the 70s brand of balls from Wham-O, “Hacky Sack” has since then been a generic trademark and there are some hacky sack games similar to this one in Asia. It’s also called a “footbag” and it’s a very active and healthy sport which takes one or more players to keep the bag in the air, and despite its gain in popularity in the 70s it has existed for many years. Origins of the modern version of the hacky sack goes from way back to 1972, when Marshall and Stalberger, two Oregonians, decided to try out their new and whacky sports toy. Sadly, Marshall died of a heart attack, leaving Stalberger to push the product even further, and its popularity grew throughout the 80s. The rights for the product was bought by the toy giant Wham-O, shortly after that. Among the subcultural rock n roll communities of the 90s such as the grunge scene, and the hippies scene, the hacky sack has been a staple of a pass time. Remaining highly popular untill the 2000s, the Hacky Sack is usually loosely packed with plastic beads and pellet fillings, and sometimes with sand. They are the ultimate learning tool for replacing soccer balls, and are much easier for versatility and control. The hacky sack bags usually weigh around 50 grams, and it depends on the type of filling used. This sport’s discipline is characterized by a much harder surface of the ball than all the other footbags, as those specific bags are not very suited for freestyle or other sports. Several other shoe modifications are common in the freestyle hacky sacks. To make the handling easier, there are some modifications which make your shoes more comfortable for handling and serving the ball. Always remember to keep your toes active, since this is no soccer ball. Lacing patterns also come in handy, as there are more efficient methods of lacing up your shoe for the hacky sack. Ezypromos offer nothing but the best when it comes to high quality hacky sacks. Many professional hacky sack players prefer a more durable hacky sack, but they also pay attention to their footwear of choice. The shoe modifications offer a more suitable hacky sack handling to their advantage. If you are looking for some good old fashioned fun and high-activity playtime for your friends and family, then look no further than the Ezypromos Hacky Sack.